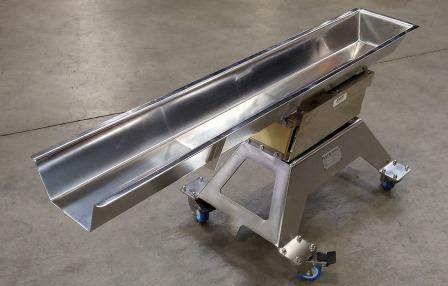 This stainless steel electromagnetic vibratory feeder processes food ingredients into luxury candy products. Based on the test results of several customer ingredients, the feeder design was customized to convey the materials more efficiently. The corresponding electromagnetic drive and Thyristor controller feature instant start/stop, 0-100% feed rate adjustability, and remote operation. Both the body and coil of the electromagnetic drive are nickel coated for corrosion resistance. The food-grade feeder pan (6 in. wide by 54 in. long) is made from electropolished, 304 stainless steel. Electromagnetic feeders are ideal for applications requiring precise control, such as batching, metering, dosing, and for friable materials. Feeders are manufactured in a variety of sizes, configurations, and drive types. They have been widely used in the food, chemical, plastics, and aggregates industries worldwide. Customization based on process and materials is available for all vibratory feeders, screens and conveyors.